Best place in Greece for a windsurfing holiday? Season? Can I do three weeks for 5K? I've only been to Vassiliki. Great atmosphere, very well equipped clubs, but I wouldn't say it had the most reliable wind. Not been to Karpathos, but everyone I know who has, says it has nuclear wind. I'm happy with 20-30kts and some decent gear to sail. check out sportive travel's website, and I think planet windsurfing still cover greece too, they give a good run down on most of the greek windsurfing spots so you can suss out what might suit the best, rentals with the mistral group are usually good quality equipment, with their hire centres on the beach, easy to change up and down. depends what sort of sailing you like. Wind in Vassiliki is great, so is the night life, the erquiptment and instruction. Conditions are light morning winds, swings mid day and fills in until around 7pm. Small steep chop, weird thing is its windier the closer you sail to the mountain. Beach is pebbles with a bit of sand just into the shore line. Conditions are anything from 7.0m to 3.4m sailing in the afternoons. Lefkas island is also a nice place to hire a jeep and go off for the day. Check out Sivota bay and Levkas town, club Milos is also a good place for an afternoon drink outside of Lefkas town. yes, Prasonisi beach on rhodes, close to lindos. jem hall runs his summer clinics there in June and September. gear rental from pro-centre was top notch, windy beach, flat water cross offshore one side, onshore waves other side, two taverna/hotels and a couple of shops, lots of euros windsurfing in speedos, and sunbathing on sunloungers when not windsurfing. Good rental gear a few years ago. Gusty gully winds with reasonably flat water. There is some info on the net. Paros is one of the most famous greek island for windsurfing and more water sports! Cold beach and pounda beach are the most suitable!! In Athens there are also many windsurf spots! Varkiza beach, Anavissos (kouros) beach, Sxinias, Loutsa! These places are located around the coastline in Attika! Andros island is also a nice place for windsurfing with strong winds! Saint Petros is a beach I have been many times! In my opinion, vassiliki beach is overatted. I have been there the windsurfing beach is not so big and the prices for rental too high!! There are also many other places like Rhodes, Creta or Karistos in Evoia and Xilokalstro for guys who like wave style!! 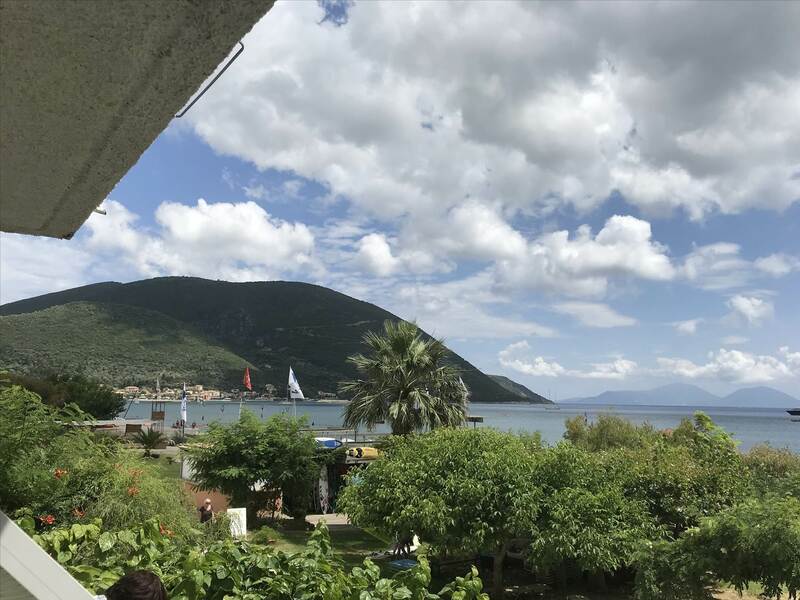 I went to Vassilki on Lefkada Island in June 2018. Stayed 4 nights at Windclub - right on the beach . Accommodation basic - but clean & well priced (booked via booking.com). Used the gear there - but it was average at best. There are plenty of other options for gear along the beach. We drove from Athens - easy drive - there is a small bridge across to Lefkada and Vassiliki is right at the bottom of the island. Hired a car at Athens Airport - Athens Car Rental - not one of the big guys - but would recommend. Check it out online. Windsurfed 3 days - first 2 were good, the last was a bit hit & miss. I sailed on 6.something each day. Each afternoon there were several hundred people out on the water - looks busy from the beach, but when you're on the water there's plenty of room. Weather was really warm & was a good time to go. No wind in the morning - that leaves time to explore the island & keep wife happy. 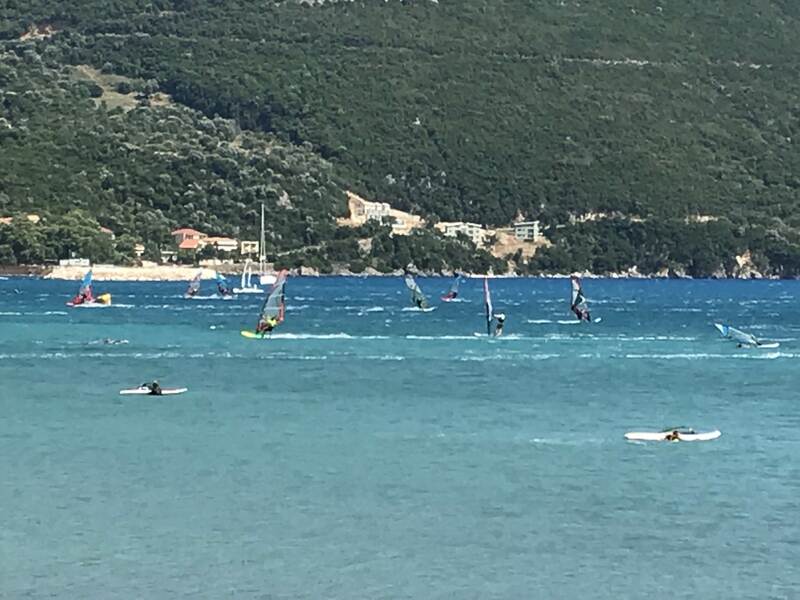 There are plenty of places around Greece (or Croatia which we also visited) to windsurf - just do your research & fit it in with your plans - just be careful to not line up with the Euro holiday season as I suspect it could be manic & more expensive. June is before peak season. Karpathos is windiest followed by Prasonisi. Karpathos is meant to be very gusty, Pras can get a bit busy and quite basic surroundings. Vass is windier than Naxos from my experience. Go to Vass if you want to party, Naxos if you want a destination a partner would like. If you travel light getting around on the ferries is quite easy, although Vass is nowhere near Rhodes for example. Great sociable team led by the owner Jens. Very good range of hire gear and pretty cheap accommodation options within walking distance. I'm only an intermediate sailor but the afternoon winds were often very strong - too strong for me. There is historical wind data going back 5 years on their website and lots of other valuable info. I'm planning to go again in 2019. Kefalos is a nice place and theres even some small waves on the other side of the island......Wind in the bay is usually off shore but with the rescue boat to hand it doesn't matter if something goes wrong. I guess these are all nice places. Naxos is certainly windier than Vass, but you would want to have an own transport as the wind may fail you at the freestyle lagoon while choppy Mikri Vigla further south sends you flying on a 4,5 on some days. Windguru statistics don't cover how the wind is sped up there. You will bump into PWA freestylers any given year in summer. Look no further than Karpathos. Accomodation on the Island generally isn't on the cheap side . 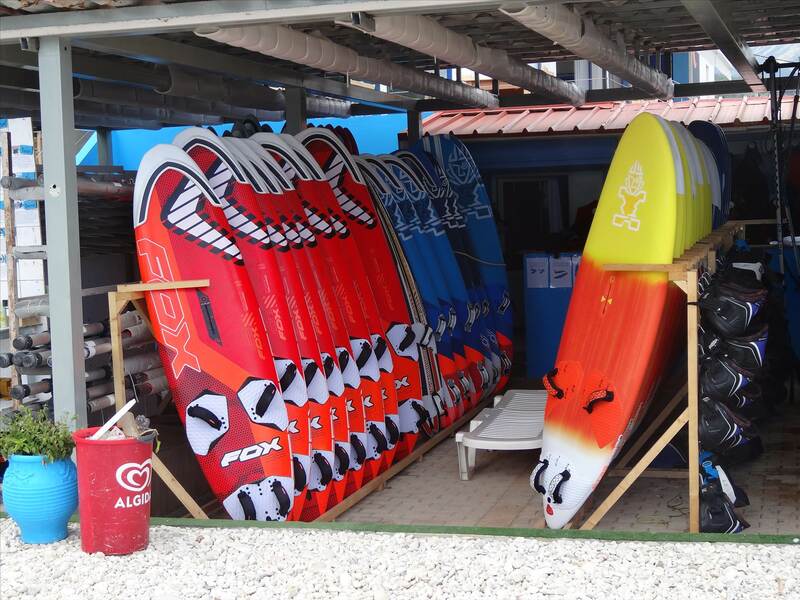 rentals with the mistral group are usually good quality equipment, with their hire centres on the beach, easy to change up and down.